Okay, I have to confess something. I am a terrible cake baker, when I am under pressure, that is. I call it the birthday cake curse. Really. I actually felt it necessary to take a personal vow like 11-12 years ago to make no more scratch birthday cakes as they always get screwed up. Any number of cakes that didn’t rise properly or cracked as it baked or broke as I tried to get them out of the pan. I could go on and on. The curse continues! Now I am gluten free and there are very limited and/or expensive options as to making gf cakes. The store mixes only make one layer so for a two layer cake it will cost about $8 not counting the ingredients added to the mix or an icing. Perhaps I should mention that I enjoy baking and it is a challenge I accept in my new gluten free life. So I persevered on this cake issue and several birthday cakes have been created since going gf and all were totally yummy. A few glitches but on the whole, I am pleased with my new gf birthday cake record. When I baked my grandson’s cake it wasn’t perfect looking but it sure was tasty. When it came out of my oven the layers sank some in the center. Re-reading her instructions at the start of the cake chapter I discovered that she does not recommend using a Kitchen Aid mixer; it is too powerful and always over beats gluten free cakes. Now I know. I just flipped one layer over and used it as the bottom. I put extra cream cheese icing in the middle. The top was level and the flavors were out of this world. This is at least the fourth time I have baked this cake for a birthday and so it is time to share it…again: I posted this last November but it is so good it is definitely worth a second share. It is from my go to cookbook; Gluten-Free Baking Classics by Annalise Roberts. Get a copy if you haven’t already. This cake is incredibly yummy, no one will ever feel cheated by the gf nature of it. And it isn’t that difficult to make, just don’t use that big powerful mixer! I like that it is make with low fat milk and canola oil; less fatty than many cake recipes. I used half the vanilla in the cake and it tastes perfect. I also measure the oil and milk and remove that tablespoon from each before mixing; she does it after mixing. I think oil and milk are hard to blend so I do it first. I iced the cake with a frosting from the “Chocolate Cake Mix Doctor”; vanilla cream cheese frosting and the contrast is perfection with this decadent chocolate layer cake. This icing spreads easily and the cream cheese makes it smooth and less sweet with a tangy undertone; it is addictive. 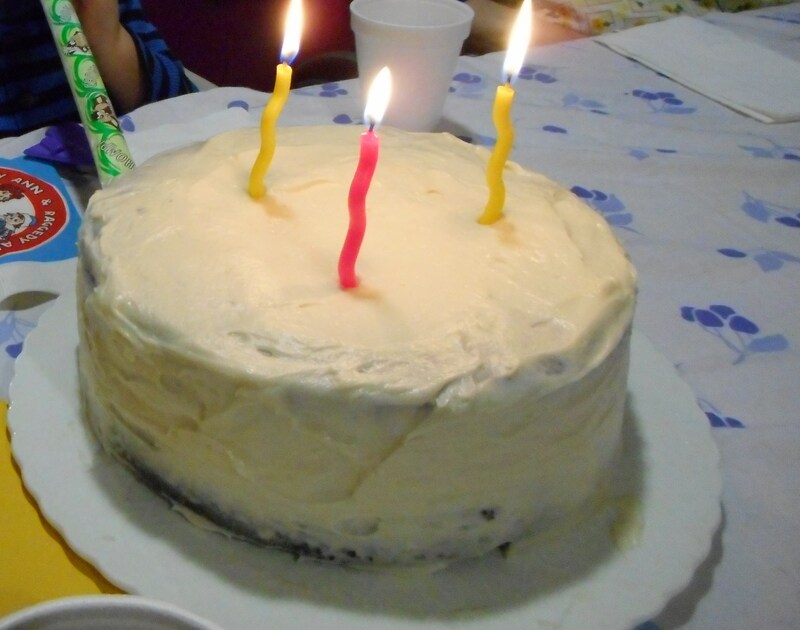 It’s a perfect combo for a birthday celebration once you poke a few candles on top. Or any kind of celebration, it is that good that I need no other recipe for a chocolate layer cake. This cake gets its deep chocolate flavor from two sources, unsweetened chocolate and unsweetened cocoa powder. You will need a fair amount of sugar to make it sweet enough. And you will need some of that brown rice flour mix I often use. The recipe for that is below. Enjoy this addictive all occasion cake! Line two nine inch cake pans with parchment paper; spray the inside of the pan lightly with cooking spray. 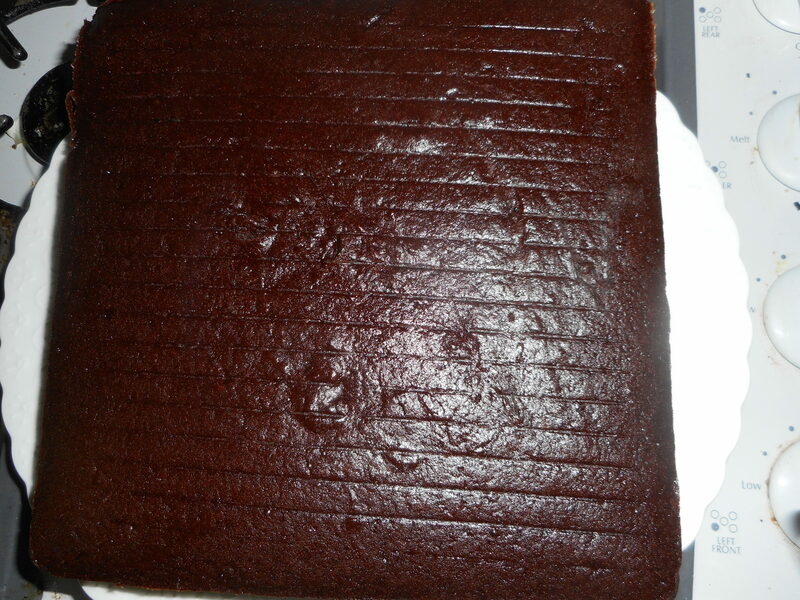 Do not use dark pans; light ones are far better for this cake. Heat the oven to 350 degrees, oven rack in the middle. Beat sugar and eggs in a large mixing bowl. Do not use your Kitchen Aid; use a portable mixer as it has less power and won’t mess up the batter like that big mixer will. Beat until light and fluffy. Blend in melted chocolate and vanilla, blend well. Add the dry and wet ingredients alternating half at a time, low speed on mixer. Mix at medium speed for one minute. Pour into the prepared pans and bake immediately. Any delay is not going to help so have the oven ready to go. Bake 30-35 minutes, until toothpick comes out clean. Cool in pan 5 minutes, run knife around edge, tip out onto a cooling rack. Flip upright so the top of the cake is on the top. Let cool completely before icing. You could make cupcakes out of it but no 8 inch pan; I tried that once and it overran the pan in a crazy “I love Lucy” manner! 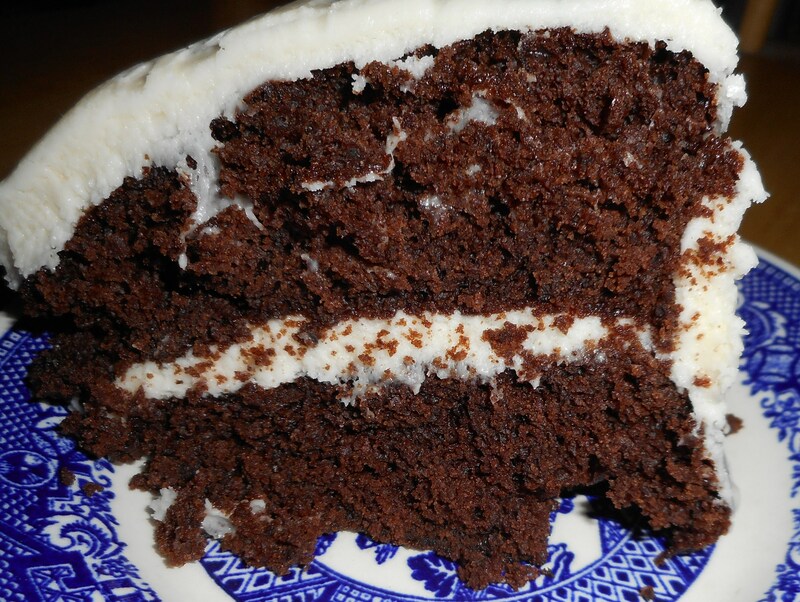 Nothing satisfies quite like a thick slice of homemade chocolate cake. This dessert is my favorite chocolate fix these days. It is a simple one bowl recipe. I love that I can make it with ingredients I usually have around. It is not too sweet which is good as I am not supposed to eat as much sugar as I have been doing. It only makes one layer which I like because there are less leftovers for me to snack on. Best of all, it is moist and tender and addictive. I made it on the fly this weekend for a belated birthday celebration, out of milk, no problem; this recipe uses water, out of butter; fine as it is made with vegetable oil. No chocolate; okay…it uses cocoa powder. I have made it 2-3 times. It is from well known blogger and prolific cookbook author Nicole Hunn. Unfortunately she doesn’t allow other bloggers to give her recipes. So I will honor that and just give you a link to her site; look it up and next time you need a quick cake, this is your recipe! This time I put a chunky peanut butter icing on top. Utter perfection in the chocolate cake department. It has a lot of unsweetened cocoa powder, sour cream, 2 eggs, canola oil, baking powder, water and some gluten free flour mix: I like a mock Better Batter recipe I found on Nicole Hunn’s blog. Use your favorite blend and I am guessing it will be good; this is a very reliable recipe. So easy: you put the dry ingredients in a mixing bowl, stir good and add the wet ingredients one at a time stirring well with a spoon. Pour it into a greased 9 inch cake pan and bake 30 to 35 minutes. Let cool ten minutes and turn out to cool. More than ten minutes and you run the risk of your cake seriously sticking. Do not frost it warm. I will say that my latest cake was made with 2 tbsp. less cocoa powder than the recipe on line. I liked it just fine; not quite as dark. My peanut butter icing is simple and spectacular. We love it made with chunky but you can use smooth peanut butter if that is your preference. For this cake I only iced the top; double this if you use it for all over or for a 2 layer cake. I used a square 9 inch cake pan; love that square look. I also used my magic cake strip; silver fabric strip that you soak in water and put around the pan before it goes in the oven. It keeps the edges from drying out and you get a more level cake. For the square pan which is too much perimeter; I just used one and clipped it on with 2 clothes pins; worked great. 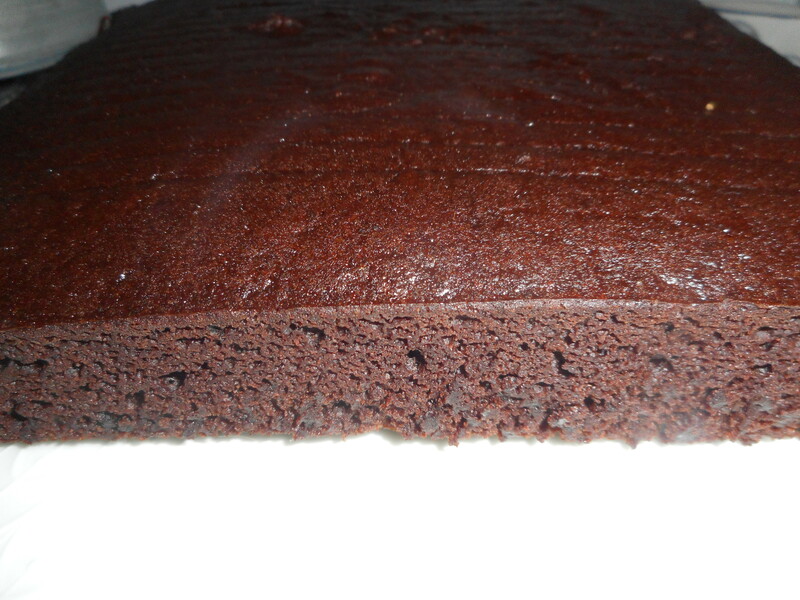 You can buy them on-line and they really work to make your cake level and keep the edges moist. The last two slices; cut on the long side and it is taking every ounce of my willpower not to eat one right now! This is an awesome cake; people rave about it, people who eat wheat every day and know what a great cake can taste like. You can make it; so easy; no mixer, one bowl, simple ingredients, no fuss and fantastic results. 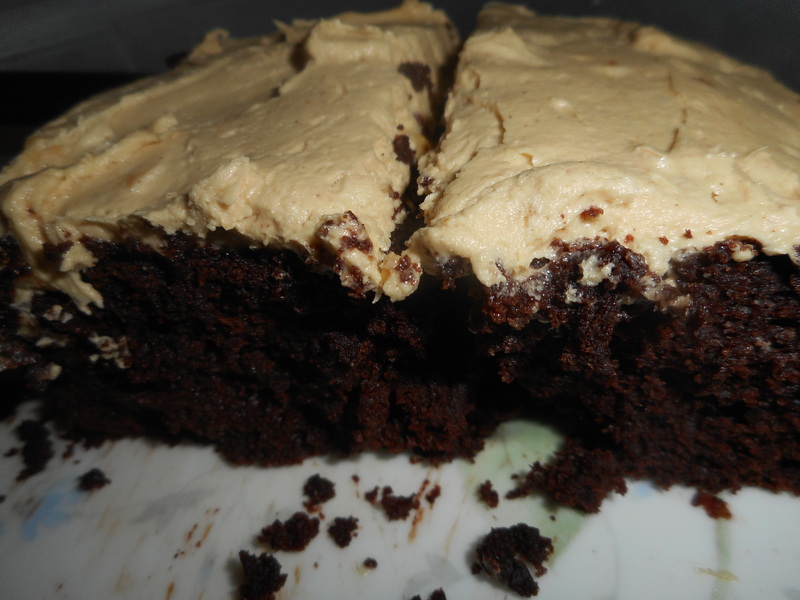 Go on her website; this fantastic chocolate cake recipe is to be found at http://glutenfreeonashoestring.com/. 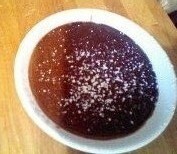 Click on recipes, type in chocolate cake, it is the “One Bowl GF Chocolate Cake” recipe. Leave in all the cocoa if you like it extra dark. She also gives a great ganache recipe for topping the cake. Dark on dark chocolate: always a winner! Check out the rest of her site; fantastic gluten free recipes. I love the look of them and you may well find a recipe for your next special dessert to impress whomever you bake for.